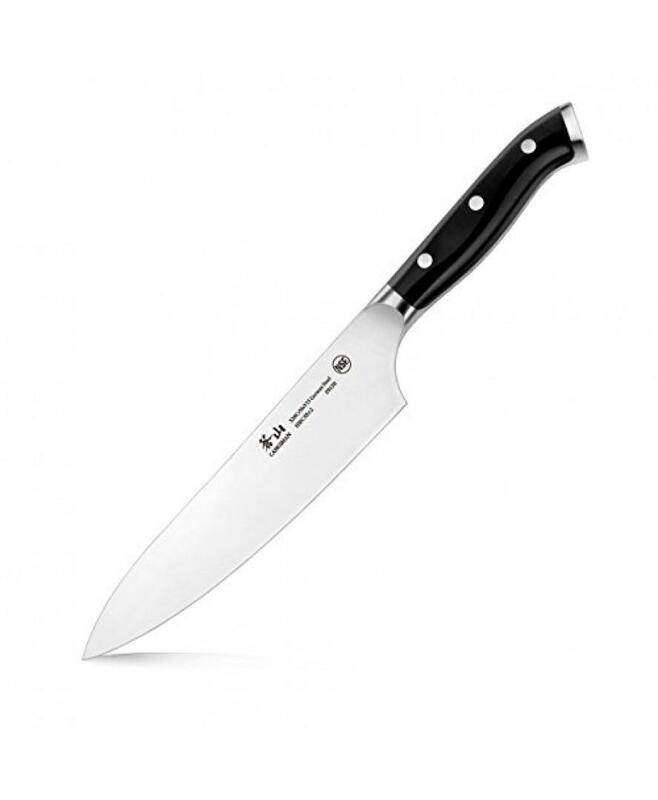 Generally, there are two types of knives namely, combat or fighting knives and utility knives for everyday use. While both the types are widely in use, the utility ones are more diverse in terms of style and blade. 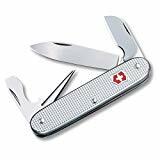 This results in a variety of everyday utility knives, each of which with a specific use such as for chopping vegetables, cutting ropes, slicing fruits, and stripping wires.This also means that each of these knives makes an appeal to different users. In other words, each of us can easily get the knife as per the work to be done. This is also applicable to the electricians who need a knife to cut wires and cables. For these professionals, those standard cutting knives are unsuitable. This is because they are neither insulated to absorb electrical shocks nor are efficient enough to cut an electrical insulation. So, there are knives, especially for the electricians. You’re in this guide and you should be knowing it already. If not, we’ll help you to choose the best electrician’s knife. 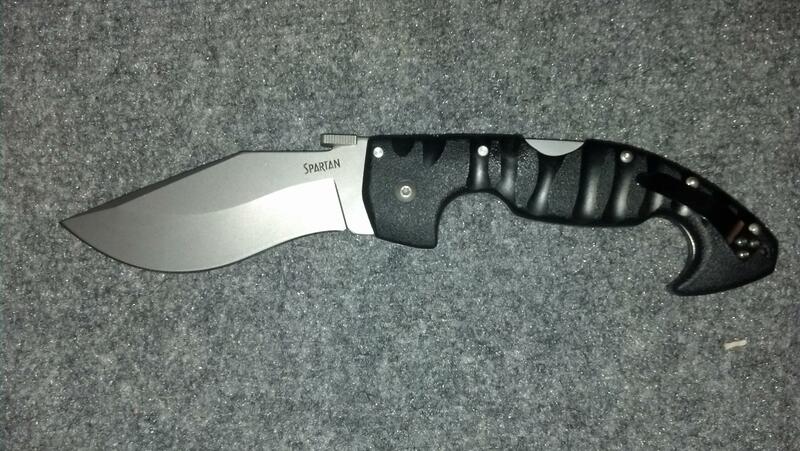 We have also provided short reviews of electrician’s knife towards the end of the article. An electrician’s knife is an exclusively insulated knife made to reduce the chance of an electrical shock while doing some repair work. Well, it is not necessary that an electrician should choose only an insulated knife. There are many uninsulated options as well, which many electricians prefer to use, such as pocket knives and multi-tools. An electrician‘s knife has many uses. It helps in cutting the cables, wires, and conductors and stripping the insulation layer from them. It also aids in cutting boxes that contain electrical equipment and in making holes. Cutting or stripping the insulation layer is such that it does not harm the core wire. For this, an electrician’s knife usually implements the exploitation methods of tapering and stage peeling. Its blade is sharp enough to deal with the cutting layer of the wire, while the edge fillet resists the core wire. Apart from cutting wires at a construction site, an electrician’s knife is also useful to chip wood and bamboo. You can even saw or carve wood and bamboo nicely with a high-quality piece featuring the multi-function ability. Such a multi-function knife is also useful for screwing a hole and drilling a hole with less effort for facilitating the thick wires to pass through the hole. With it, you can even open a bottle and perform other functions, as it might come with some tools such as scissors, saw, bottle opener, and a ruler. Most cable and wire joints use rubber or plastic bands for strengthening the insulation. A multi-function electrician’s knife can easily cut off such bands. Most suitable electrician’s knives feature a combination of a spear blade with a locking blade acting as a wire stripper. This design is based on the military TL-29 specification, which has now become very rare. 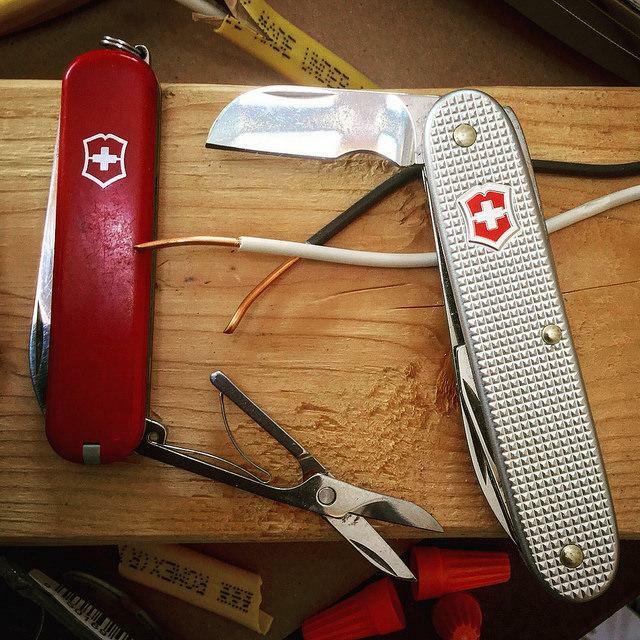 It was originally used in the electrician’s knives that were designed during the 1930’s and 1940’s. After these decades, these knives were made only on the Government contract.Any government issued electrician’s knife generally has the TL-29 mark on them, where TL stands for Tool for Linemen. The original TL-29 was released during the World War I, which featured a 3 5/8-inch handle in the sleeveboard design and with wooden scales, and an internal lock released by pressing the folded main blade. During the 1930s, the design was revised to hold a 3.75-inch standard jack; wooden, plastic, or jigged bone scales; and a patented lock from Watson and Chadwick, which is an ancestor of the now famous Michael Walker’s locking mechanism, the Liner Lock. Since the early 1900s, the electrician’s knives are designed for both civilian and military use. One of the most ancient but still famous suppliers of such knives is the Mathias Klein & Sons (M. KLEIN). Even today, you will find many variations of the TL-29 specification, of which the most common one is with a blade at each end and a master blade with a sheep foot style. Another popular brand is Linseman whose knife is in use electricians. Its knife has a main blade, which is usually a spear master and a screwdriver blade as the secondary one acting as a wire stripper. A liner lock locks the screwdriver in place. In a few civilian models, you may find a hawkbill blade instead of the master one or even a third blade. In short, there are single and multi-blade options available for the electricians. The knife that has a screwdriver blade, a hawk bill blade, and a spear point blade is also known as the Janitor’s knife. A few firms tend to offer full-sized models featuring a pruner-style master blade. There is also a hooked blade that can easily strip the insulation layer from a heavy cable. If you look around in the knife market for electrician’s knives, you are likely to come across different types of blades. Each of these blades, although short, caters to specific functions or uses. So, it is essential for you to be aware of how they differ from each other if you intend to choose the best electrician’s knife. Here are the different types of blades to consider for an electrician’s knife. This style features a straight spine for creating parallel lines. It also comes with a thin and sharp point for stripping wires and opening boxes. This style features a straight edge with a convex spine bowing down to intersect with the edge at the blade’s tip. The design is quite safe with no concrete tip for piercing. As the name suggests, a sheepsfoot blade is genuinely in use for trimming the hooves on a sheep. However, today, it is also in use for carving the wood, sharpening a knife, or doing some fine electrical work. Sheepsfoot blades are also known for their characteristic of safety due to which they are in use for teaching knife skills to kids and cutting ropes on a ship. With such a blade, you are unlikely to stab yourself with it when a ship shakes suddenly. In case of an electrician’s knife, this blade features an expert design for effortlessly drilling via different materials. The end is so well-sharpened that it can drill even the hardest material smoothly. As its variation, you may come across a sheepsfoot slitting blade. This style features a curve on its tip, which is ideal for having detailed cuttings. It is also perfect for heavy-duty purposes such as stripping larger wires. This style features a straight, symmetrical design with a sharp edge and point.The tip is in line with the middle line of the axis. Usually made with double edges, this blade is chiefly used for piercing. It is also known as one of the daggers, as the term dagger represents several types of blades across different cultures. Many alterations are made since a past few years due to which you can easily find a myriad of single and double edge models on fixed and folding models. However, the design is usually unfeasible for daily carry and is more suitable for tactical or fighting models. Still, for electrical work, a spear point blade can effortlessly cut through the hardest material. Originally, the hawk bill or pruner blade was used as a harvesting hook for agricultural produce such as grapes. A bigger size was ideal for pruning fruit trees. However, the same blade made its way to the electrical field when linoleum was developed for which inventing an easy way of cutting became essential. Today, it is also used to strip the insulation from the ends. Usually, a hawk bill blade indicates that the knife in your hand is a pruner. 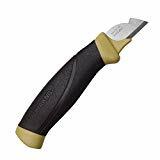 Apart from pruning and stripping electrical insulation, a pruning knife is also useful for cutting materials such as linoleum, string, carpet, and roofing paper. 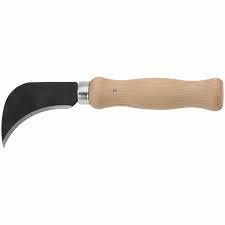 Physically, a pruning knife is a large, curved jack. However, the difference between any two pruners is in the terms of shape and size. The most typical variation is visible at the ends; some have rounded-head ends, while a few have flat heads.Most pruning knives have a single blade but some come with a second blade known as the pruning saw. You will typically spot a hawkbill style knife in the hands of seasoned electricians, which resembles a hawk’s nail. The blade’s curved edge is ideal for preventing the wire from slipping off the blade while stripping toward yourself. Such a knife is perhaps an ideal model for stripping large conductors, while its tip is perfect for stripping non-metallic sheathed cable. At times, you will also see a curved hawk blade. The curved shape facilitates easy cutting of wires for removing the insulation. Well, when it comes to buying an electrician’s knife, you will find them in two basic categories namely, utility and pocket knives. These knives are commonly used in tasks related to trade and construction. In the electrical field, they are usually known as the razor knives, as they feature a razor blade, which you can remove after heavy use. These models have a screw whose removal paves a way to the razor blade. 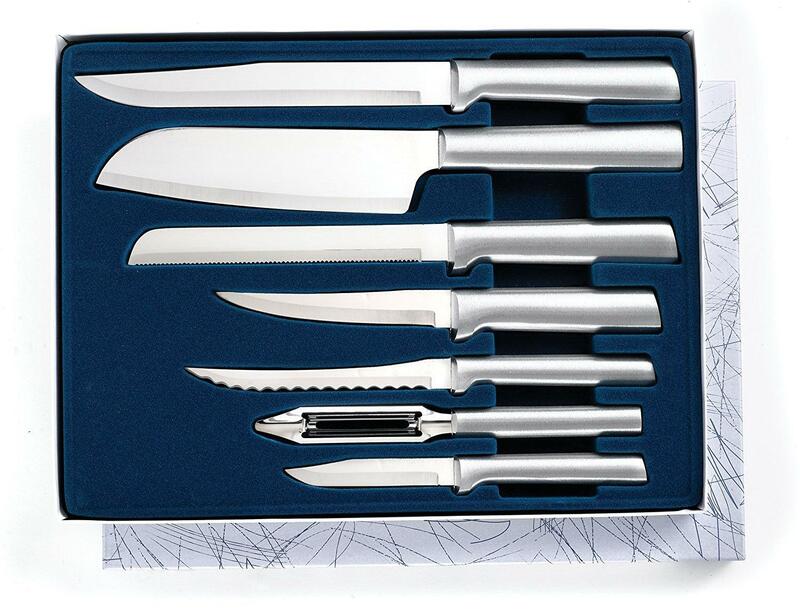 There is also a storage space for storing additional blades within the knife. You can go for any utility knife if you are on tight budget. You can easily pick a big pack of blades at a highly competitive rate. Another benefit is that there is no need to sharpen a utility knife. All you should do is, just replace the razor blade. The fact is that most electricians do not usually carry pocket knives for their daily tasks. However, it is most useful in the trim out phase for which the electricians do not keep all the tools. They carry only a few ones for trimming the switches as well as plugs, for which a pocket knife is simply efficient. A pocket knife is handy, as it easily discards Romex sheathing and significantly alleviates the tool belt’s weight. Above all, it fits smoothly into a pocket! While looking for an electrician’s knife, there are factors to consider for choosing the right tool. The interpretation of the ‘right tool’ is ‘the tool that suits your needs’. So, first, it is essential to recognize your needs. It is not necessary that the needs of all electricians are same. However, they might be similar or can vary significantly. For example, some electricians prefer having a foldable and lightweight model, while other prefer having a fixed and long model. The latter ones do not like to move with a heavy pocket and need such a model for performing heavy-duty jobs. This is basically fixed versus folding style. Selecting one of these styles is totally on how you wish to carry your knife. Folding knives are shorter and thicker, while fixed ones are thinner and longer. Further, the fixed blades need no locking system, but require a sheath for carrying it safely. Similarly, the folding knives slide smoothly into the pocket. You can choose a folding pocket-size electrician’s knife if you will be using it often. If you wish to carry an electrician’s knife daily, it must be as light as possible in weight. However, at the same time, its size should be also appropriate. Of all the available weights, a 3- to 5-ounce weight is ideal, as it is perfectly light and does not weigh the pocket down even if there is something more inside. So, a lighter tool is a rational choice. Still, you can find heavier models weighing up to 4 and 4.5 ounces. You can choose it if you desire to try one such model. However, just go through the local laws and regulations. This is because not all regions allow carrying a knife without an acceptable purpose. As a fact, in several states, it is illegal to carry a blade. So, there are regulations that dictate the valid blade sizes to carry for both professionals and laymen. Usually, a larger blade that is above 4 inches, which is essential for outdoor and heavy-duty tasks, is legally prohibited in public places. Any knife with a blade whose length is between 3 and 4 inches is allowed. Such knives are more flexible to handle heavy jobs and detailed cuts. In fact, a knife with the blade being 3 inches long is a pure daily-use tool.So, you should consider the length of open blade to know how legal it is and how well the tasks would be done. As a tip, go for a length of not more than 3.5 inches, as then the overall knife length would be somewhere between 7 and 8 inches. These knives are generally lightweight. In case you choose a knife that measures over 8 inches in length, you may have to compromise the lightweight factor. At the same time, do note that any blade below 3 ounces is super small as well as light. Another thing to keep in mind is that avoid buying a blade as big as possible. You should understand that the blade length is a customization factor for fulfilling your specific needs. While a small length is ideal for more control, a big one is for better reach. High-carbon Steel: Holds a great edge and easily sharpens. It is harder in case the carbon content is more but is still brittle. On the con side, it is vulnerable to rust and discoloration, but does not compromise performance. Stainless Steel: Has all the plus points of high-carbon steel, but eliminates the probability of discoloration. The high level of hardness ensures longer edge retention. The only con is that it takes some sharpening effort. The amount of carbon denotes the level of hardness. If it is too much, it is not possible to sharpen. Similarly, if it is too little, it is vulnerable to rusting. Titanium: Is more durable and lighter than steel, is easy to sharpen, and retains the edge longer than steel. This makes it ideal for an all-purpose knife. However, these benefits are maximized if you choose pure titanium knife, and not the titanium-coated or titanium-edged one. Ceramic: Is light, tough, resistant to reactions, and retains the edge longer than steel. However, it is more brittle than steel. Some of the top-quality steels that are known for their good edge retention and corrosion resistance are AUS8 and 8CR13Mov (frequent sharpening required), 420HC, VG-10 (on budget), and 154CM (upscale). This is something that a Rockwell machine measures on the scale of A, B, or C indicating the extent of penetration. A greater scale means less penetration and more hardness of steel. Usually, for steels, the rating is on the C scale range from RC 55 to 60. Carbon Fiber: Is made of plastic as well as alternating layers and is rugged as well as visually appealing. Fiberglass Reinforced Nylon (FRN): Is strong, rugged, and efficient but is not visually appealing. It offers a great grip. Zytel: Is affordable, unbreakable, resistant to abrasion and impact, and durable. It also offers better grip than other options. G10 and Micarta: Have similar layers like fiberglass but of other materials. 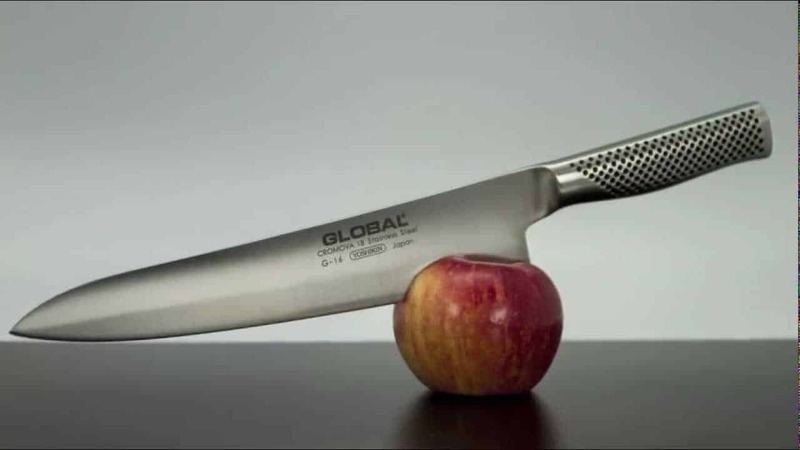 While Micarta uses compressed linen resin, G10 uses fiberglass. Still, both are strong and durable. However, G10 is light and resistant to water and is harder than Micarta. Metal: Is typically stainless steel and titanium and costs more than the above options. Even aluminum is available, but does not offer a convenient grip. Titanium: Is light, highly durable, and resistant to corrosion, but is not visually appealing. Delrin: Is known for its unbreakability and maximum durability factors. Nylon: Is mostly impact-resistant, insulated, and comes with a rubber grip when used in knives made for the electricians. One of the essential safety features to look for is a locking mechanism. This feature is essential if you wish to get a folding pocket knife for an electrician. Most electrician’s pocket knives come with a liner style lock, which is reliable. The liner lock works by securing the blade when it is in the opened position. Another feature to look for is the ergonomic finger guard. It ensures safe handling and keeps injuries at bay. If you are a leftie, a double-ground spur is also a worthy safety option. Strips a wire in a pinch with its straight edge blade in a folding style. The blade is 3.4-inch long, is made using AUS-8 steel, boasts a satin shape, and has a clip point shape. There are three strippers namely, a stripper bar, hole stripper, and an adjustable spring-loaded stripper. Other features include an insulator thumb, high-voltage tower clip, and schematic glass-reinforced nylon grips on the handle. Weight is 3.3 ounces. It is the most expensive one in this list. It is an exclusive short blade knife with heavy-duty, full-sized, and yet convenient handle with good texture and tight grip. 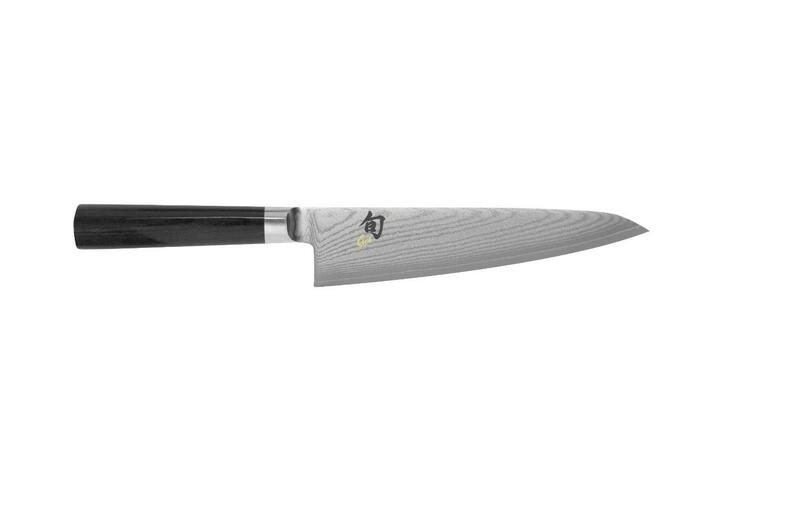 It features a 1.75-inch long coping-style blade that is designed using the finest cutlery steel. This steel retains its edge well and is tough.There is a hang hole for portability and storage. Weight is 2.4 ounces. It is a compact multi-tool for the electricians with silver finishing. It comes with a large blade, wire scraper, wire stripper, electrician’s blade, bottle opener, and a reamer. Blades are of stainless steel, while the body is of aluminum alloy that is free of rust. It weighs 0.15 pounds only. Features a short, 1.3-inch sharp and durable blade of Sandvik stainless steel with a double-ground spur for stripping wires and scaling cables with right or left hands. The ergonomic handle is double molded and has a grip of high friction for superior control. There is also a finger guard for additional safety and a plastic sheath with belt clip for storage. It weighs 2.1 ounces. 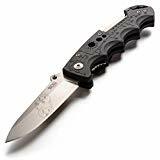 It is the most affordable pocket knife in this list with a customized 3 3/8-inch sheepfoot’s blade for electricians and insulated nylon handle. The blade is made using 420 stainless steel.The knife is exclusively made for the professional electricians for stripping wires and performing other duties. It weighs 4 ounces. We hope this guide help you to start your own hunt for the right knife. Please do read the reviews in market places such as amazon.com as well. If you have any questions or comment do drop in below.